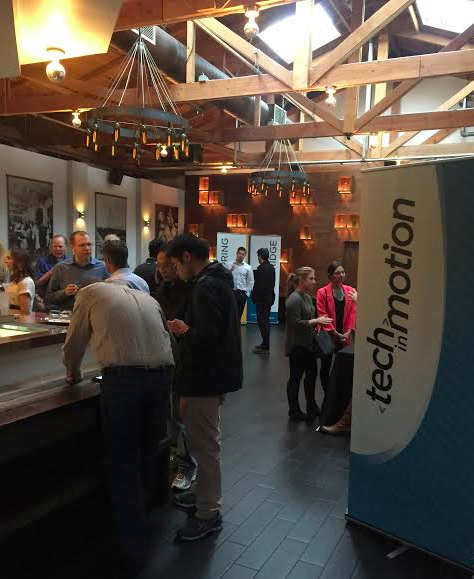 Equilar sponsored a Tech in Motion Meetup at the SP2 restaurant in San Jose, CA. It was a first for us as our HR department has embarked on a mission to get the Equilar brand out into the Silicon Valley tech scene. Silicon Valley is one of the most vibrant economies and it attracts all types of people. 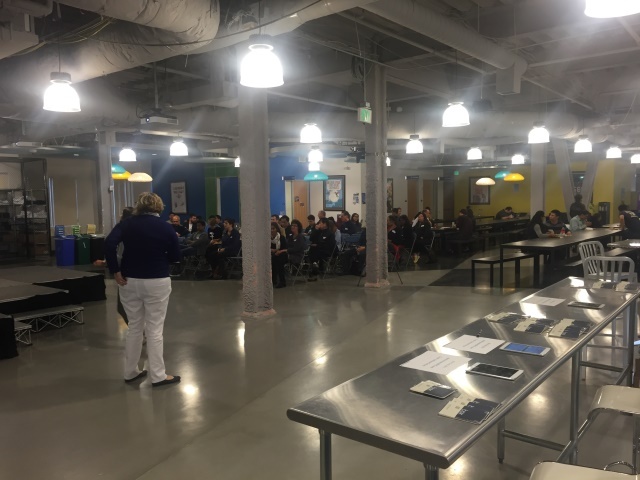 Whether you want to learn tech, get into a startup or make a career change, a meetup is a fantastic place to network and meet other like minded individuals. Our company was there to recruit! Cross promoting the meetup on LinkedIN mobile. During the days leading up to the event, we sent out tweets and posts on Facebook and LinkedIN. We watched as the RSVP list grew to 164 people! I had high hopes for this event. Later at the event, I was told by the event organizer that some of their larger events can grow to as many as 500 people. It’s a sure sign that these things are working. Deep in downtown San Jose, this restaurant is very spacious with a great patio and a nice room in the back where this event was held. It looks like this part of downtown is under some serious renovation. When I Googled Mapped the location, there was an empty parking lot across the street from the restaurant. Now there’s a multi-story building being built in the area across the street where the parking lot used to be! Our company had premium billing at the event. As you walked through the patio into the restaurant, you are drawn to the room just past the bar where the Tech in Motion event was being held. Here’s what it looks like as you approach. Entering the Tech in Motion Event, 6:06pm it’s just beginning. Now note the girl in the red jacket behind the sign. She’s actually talking to Megan, our SR. HR person at Equilar. Our table was right behind the sign. You had to walk right past it as you entered the venue. From the inside you can get a better idea of what the setup looked like. Here’s the view from inside the room looking towards the entrance. See the red coat girl? Megan (in black) talking to the girl in the red jacket. Once I walked into the room and grab a beer, I started talking to people. People from all walks of life and all kinds of interests. There was a guy who just moved from Indiana. He wanted to break into Tech and was trying to figure out how to get going. I met an engineer who was a one man startup. He was launching his on demand video chat service and looking for a partner. A few people showed off the apps that they had written on their phones and wanted to know what we were looking for in the two positions described (Engineering Lead & Automation QE). Then there was a more mature gentleman who had spent 10 years creating online training and was looking for a new venue for his skills. A great surprise was an old friend who had moved to Australia was in town! He had dropped by the event and surprised me. What a small world! Then, of course, there were lots of recruiters! The companies represented were equally varied. I met 2 people who were Googlers working on open source projects that were soon to be monetized. Unfortunately they were not looking for a new job. I met hardware engineers designing systems for cars. One of these people worked with Mercedes Benz and was investigating human/car interactions. A professor at Carnegie Mellon was in the crowd as well as a QA Manager that looked like “Pit Bull”, the singer. After a few brewskies I realized how busy the room had become. I just moved from group to group shamelessly asking people what they did, who they worked for and if they were looking for a new challenge! Hey, when you have to work a crowd and only have about 30 seconds with each person, there’s no time to waste! At about 8pm, the room was buzzing! It looked like there was at least 75-100 people in the room at any given time. I would occasionally look over at the Equilar table (you can see our vertical sign – left of center in the picture above) and see how Megan was doing. She was just as busy as I was and sent a few people my way. 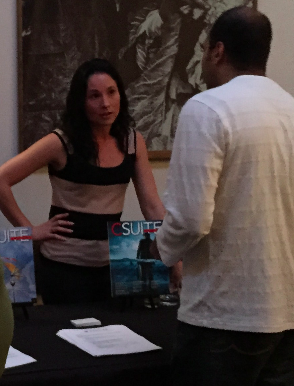 She was all smiles and chatting up a storm telling people about our company and the positions that were available. Every once in a while if I noticed someone was taking too much of her time, I’d go over and run interference. You have to watch out for your team member! Megan talks to a guy inquiring about our job postings. It was surprising how fast the time passed. The event was scheduled to go from 6-8pm. I was talking to another attendee when I noticed that Megan was beginning to break down Equilar table. I took a quick glance at my watch and realized that it was close to 8:30pm. I helped to pack up the table and take the boxes to Megan’s car. When I returned to the venue, there were still at least 15-20 people milling about. By this time I was getting a bit hungry and decided to stroll downtown and find a place to eat. I found a nice gastro-pub and had a nice dinner as I pondered what I had learned in our first ever meetup sponsorship. Tonight, a lot of people got to know what kinds of services our company provides. We talked to as many people as we could in the time we had. An even greater number of people got to see the new Equilar logo and branding. Even if they didn’t find out what we did, they will begin to recognize our name and brand when it inevitably comes up again. The HR goal of gradually getting the Equilar brand into the minds of a new cross section of tech professionals had been achieved. I’ll have to follow up with the several people I met at the event. On my way home, I noticed 2 LinkedIn requests to connect appear on my phone from people I had met. While I was writing this post, I was sent the resume of a Automation QA Engineer I met this evening who is currently contracting on a project at Google. 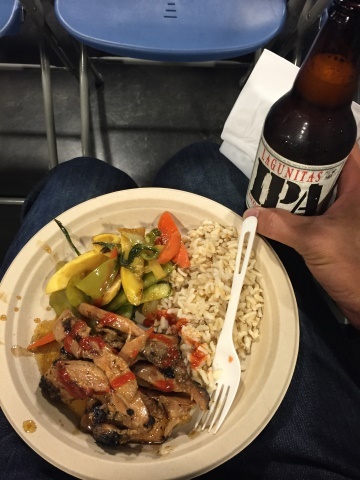 Yup, meetups work. Overall, it was a great time. I really encourage you to goto a Meetup in your area. It’s a fantastic way to experience the pulse of the people who make up the tech scene. And you never know, you my find your next startup partner or company employee! 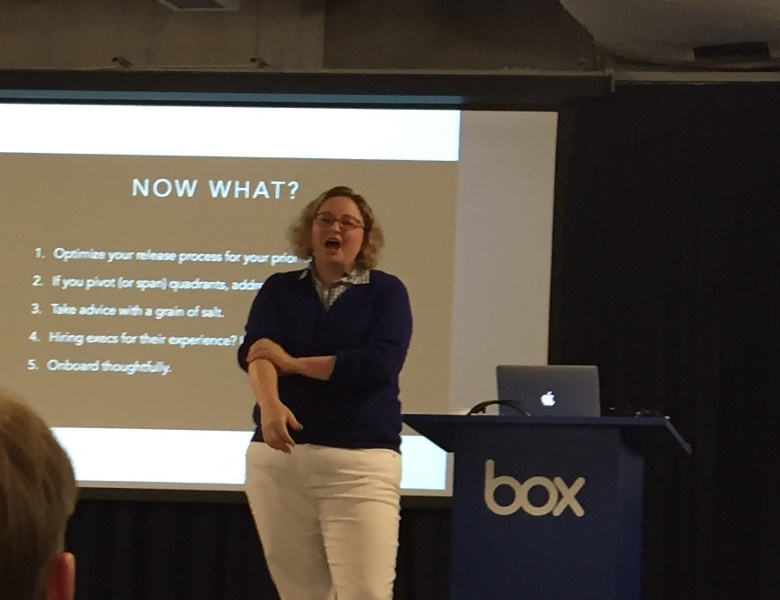 This evening I attended a Tech talk at Box.net’s HQ in Los Altos. 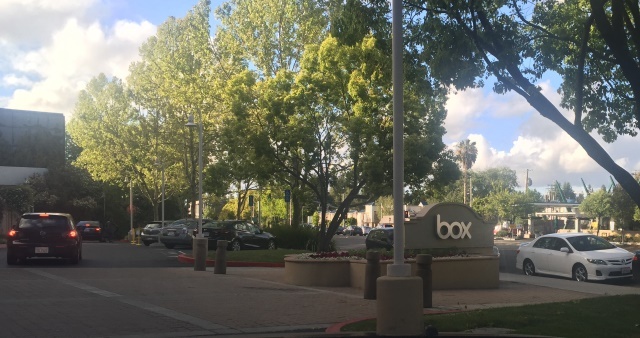 Not only is Box a great product, they will be our neighbor in Redwood City soon as they build their new HQ by the Caltrain station. The topic of the evening was near and dear to my heart. 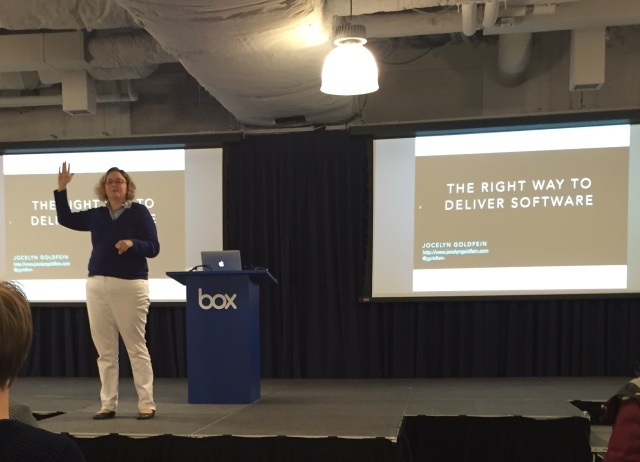 “The Right Way to Deliver Software”. The speaker was Jocelyn Goldfein. She led the engineering team at Facebook that created news feeds and photo and then headed up their pivot to mobile. She was an early engineer at VMWare so she understands enterprise software sales. She was a CS geek at Stanford. So I figured she’d be someone I could learn from! I parked underground and then walked up to their version of the “Lair”, which is what we call our common space in Equilar’s offices. It’s where we hang out, have lunches and coffee, and do company meetings. 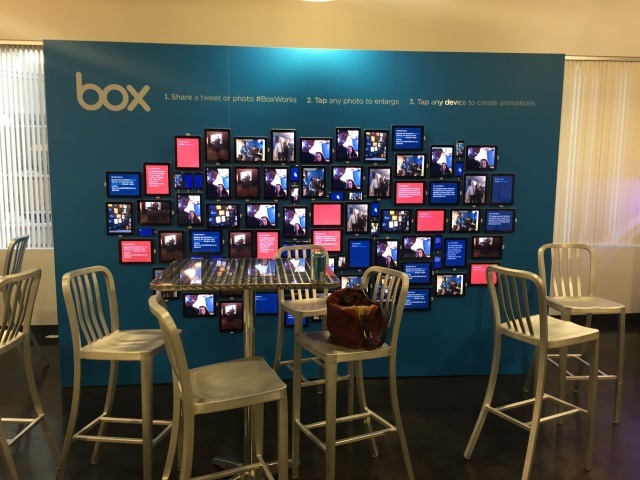 Box’s Lair had a cool tablet wall that was interactive. Now their Lair was a little larger than ours. Here’s the view of the space from stage left. There were some nice moleskine notebooks on the table and a buffet at the right as you came in. A Nice Industrial Chic place for a meeting. First, here’s a spoiler. There is no panacea for creating software there are tons of dependencies to consider. Everything is a tradeoff and you have to understand the market you serve and the product you are trying to deliver. This is where experience and understanding comes in . You have to prioritize and decide what is most important to you. In this slide she lists some pretty high level items. Features – this one is self explanatory I think. User Experience – wonky or slick and modern? Performance – how fast must it respond? Reliability – are we talking five 9’s or is it ok to have intermittent outages? 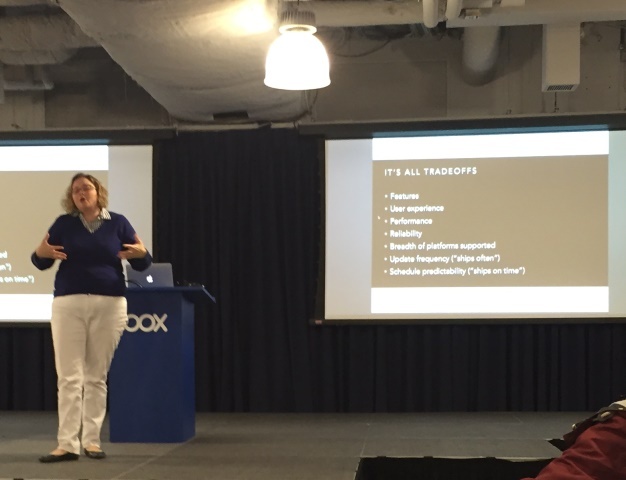 Breath of Platforms – she was referencing the Facebook mobile app here. Schedule Predictability (“Ships on Time”) – believe it or not, this isn’t so important in FB’s case. The last one was particularly interesting to me. Facebook (Web) ships 9 times a week! Twice daily and once on Tuesdays. Since they test and iterate so much, there isn’t a set feature release target. Things that factor into a product release. Cost is dictated by the tech stack. If you are deploying on your own hardware or data center, it doesn’t cost so much to get your application to the customer. If you are deliver a mobile app, there are a lot of steps before it gets into the hands of your customer. This takes time and time is money. What about the environment stack? It costs a lot to test multiple platforms and hardware configurations. This is one of the things we love about web apps. Benefits is dictated by the business model. If you sell a high dollar product, then you must have a more reliable and predictable release cycle. It also better be available at all times. Surprisingly, the more consumer and free it is, the UX becomes more important for retention. This was a very interesting concept. Depending on the product you are creating, the cost of doing something wrong can vary widely. Let me explain the diagram. The vertical axis is “Enterprise $$$” on the bottom and a “Free / Ad Supported” product at the top. On the horizontal axis we have an “operating system” (think Windows or VMWare) on the left and “Web” based app on the right. Beware if you are in the bottom left! If you have an enterprise based OS to sell (think Windows or VMWare), your release cycles are long and having to do it over because of a mistake could cost you 100X the cost of shipping it right once. On the extreme opposite is a free web app. If you screw it up, many folks won’t go crazy, users will not lose money and doing it again only cost 1X. Then we have the two other quadrants at 10X. My company’s products fall in the lower right quadrant at this time. 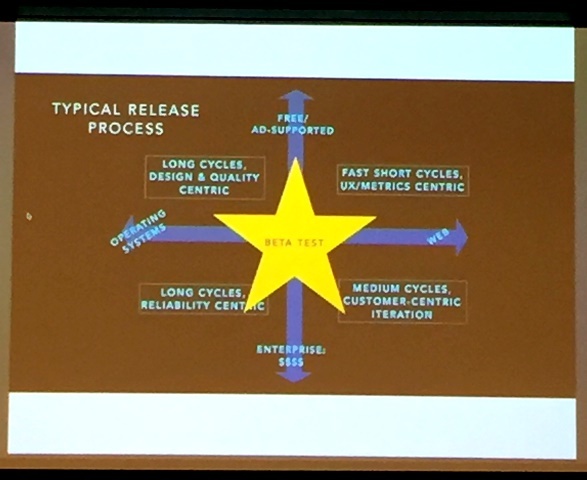 Because of this we cannot just release whenever we want, but we must test and have a pretty predictable cycle. This of course implies increase cost as compared to a quick web based startup. Another way to look at the diagram is to compare it to a release process. The star in the middle is a reminder that no matter what you do, you must beta test. Facebook started in mobile creating a completely web based application. They thought that this would give them the fastest release cycle at the lowest cost. They soon realized that the best experience could only be achieved if they went with a native mobile application. It took them years to make the transition because of a culture divide. Web(HTML5) developers went fast and iterated often. They could get feedback in hours and release again. There was not release cycle set in stone. Initially they thought that going to native would be the same. Bad mistake. A cycle in mobile took 8 weeks from creation to final delivery to the user and then acting on the feedback received. It was a culture shock to the mobile team. In fact, most members couldn’t make the transition. Facebook hired new developers and had a few “acqui-hires” instead. It was a hard lesson. Each group thought the other group did things wrong. If you need to make a radical shift, be ready to change the team. In the end, the “North Star” was focusing on what the users need and not what the employees needed. The focus on the best thing for the user dictated how and what was built. So how do you apply the things learned. Jocelyn wrapped it up with a few key takeaways. Understand your priorities before you optimize the release process. 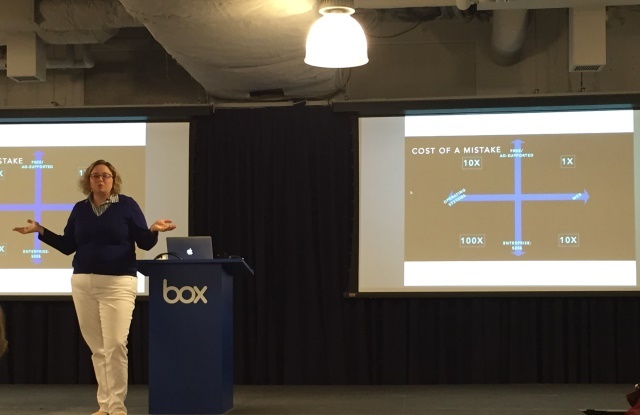 If you have to pivot, be prepared to address culture issues. Take advice with a grain of salt. Each product is a little different. It’s not one size fits all. Hire for experience? Conclusion was that this is important if you know exactly what you are going to do. Otherwise, hire for the right DNA that fits with your company. Onboard thoughtfully – know what culture and processes will be needed and train early. The best people are those who are malleable and do not have absolute dogmas. You need people who are willing to learn and change. These are the best hires. Here’s my favorite quote of the night. What you say? The premise is that when you are a child everything is new and you just accept it and learn. As you grow up, you start to gain opinions and internalize data and experiences. Everything starts to get measured against that. The only thing that can really change your attitude and what you have learned is if it was painful when you didn’t change. Oh, and it wouldn’t be right if I didn’t post a food picture. Box served us Chicken, sauteed vegetables and rice. I washed it down with and Indian Ale. One of the things I love about the valley is that there are so many great people, places and opportunities to learn. 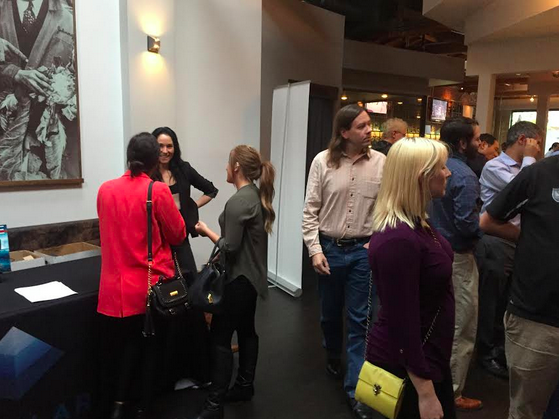 I really encourage you to find the meetups in your area and network! You get free food, meet new friends and sometime even learn a thing or two! 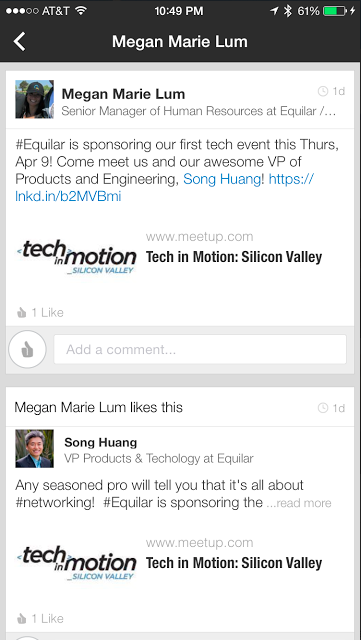 And speaking of meetups, our company (Equilar.com) is sponsoring a meetup on April 9th in San Jose California. Here’s a link below to all the details. I’ll be there so come find me if you are in the area.